US President Donald Trump arrived in Singapore today to join North Korean leader Kim Jong-un for a historic summit which could lay groundwork for ending a nuclear stand-off between the two countries and see Pyongyang dismantle its arsenal in return for economic help and security guarantees. Trump, 71, landed at Paya Lebar Airbase on board Air Force One after cutting short his time at the G7 summit in Canada. He was received by Singapore’s Foreign Affairs Minister Vivian Balakrishnan. Hours earlier, Kim had arrived in a jet and was received by Balakrishnan before heading to St Regis Hotel. “Welcomed Chairman Kim Jong Un, who has just arrived in Singapore,” Balakrishnan tweeted. Kim held a meeting with Singapore Prime Minister Lee Hsien Loong ahead of the planned summit. He thanked Singapore’s organisation of the summit as if it was “their own family affair”. “If the summit produces positive outcomes, then the Singaporean government’s effort will be recorded in history forever,” Kim said. “The entire world is focusing on the historic summit between the DPRK (North Korea) and the US, and thanks to your sincere efforts … we were able to complete the preparations for the historic summit, and I would like to thank you for that,” Kim, speaking through an interpreter, told Lee. Trump and Kim are set to meet on Tuesday at the Capella Hotel on Sentosa for talks which could see North Korea dismantle its nuclear arsenal in return for economic help and security guarantees. 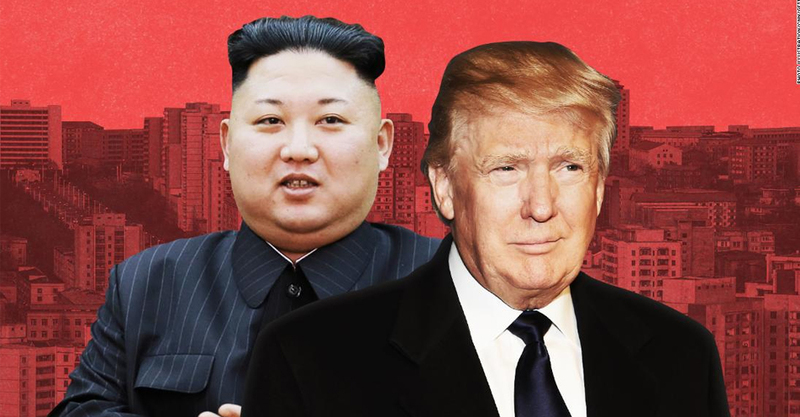 The summit will be the first meeting between Trump and Kim and mark a turnaround of relations between the two leaders after a long-running exchange of furious threats and insults. The two leaders have had an extraordinary up-and-down relationship over the past 18 months. Trump had called Kim “Little Rocket Man” and threatened to unleash “fire and fury like the world has never seen” on North Korea as it conducted several ballistic missile tests in defiance of international warnings. In return, Kim, said to be in his mid-thirties, called Trump “mentally deranged” and a “dotard”. North Korea had also threatened to strike Guam, an American territory in the Pacific Ocean. The North Korean leadership, including Vice Minister of Foreign Affairs Choe Son Hui has also taunted Washington, calling Vice President Mike Pence a “political dummy.” Trump hopes the landmark talks will kick-start a process that eventually see Kim give up his nuclear weapons in an irreversible manner that can be verified internationally. In March, Trump surprised the world by accepting an invitation from Kim to meet in person. But last month, Trump abruptly cancelled the Singapore summit, citing the “tremendous anger and open hostility” by Pyongyang. However, he took a U-turn soon and said the White House was proceeding with the preparations for the summit. Ahead of his much-anticipated meeting with Kim, the US President sounded optimistic and said the meeting would be a “one-time shot” at peace. “I feel that Kim Jong Un wants to do something great for his people. And he has that opportunity, and he won’t have that opportunity again,” Trump said. While en route to Singapore, Trump said he looked forward to meeting Kim on what he anticipated would be an exciting day. “I am on my way to Singapore where we have a chance to achieve a truly wonderful result for North Korea and the World,” Trump wrote in a pair of tweets. “It will certainly be an exciting day and I know that Kim Jong-un will work very hard to do something that has rarely been done before … Create peace and great prosperity for his land. I look forward to meeting him and have a feeling that this one-time opportunity will not be wasted!” Singapore will spend about 20 million dollars to host the historic summit between Trump and Kim, Prime Minister Loong revealed. Singapore is one of the few countries that have diplomatic relations with both the US and North Korea. It has been used before for high-profile diplomatic occasions. In 2015, the leaders of China and Taiwan held historic talks in the city-state – their first in more than 60 years.